The Magnes Zionist: Men in Black -- Welcome to Ni'alin! YNET is reporting that, for the first time, a group of the ultraorthodox, anti-Zionist Neturei Karta, joined Palestinian and Jewish protestors at Ni'alin. Read about it here. Welcome! Every little bit helps! Of course, cynics will say that this is just a ploy to advance an anti-Zionist agenda and that ultraorthodox Jews are not known as champions of human rights. Well, there's truth in that. But the anti-Zionist ultraorthodox have often used arguments that speak of justice and peace with the Palestininians -- if not always for love of Jacob, then for hatred of Esau, i.e., the Zionists. And the respect has been reciprocated. What is new, as far as I know, is that the Neturei Karta have generally avoided participating in demonstrations organized by secular leftists. Of course, here they were invited by the Palestinians. But I certainly wish I had been in Ni'alin to stand shoulder to shoulder with the men in black! In a related story, Neturei Karta have criticized the IDF for conducting ethnic cleansing in Gaza. 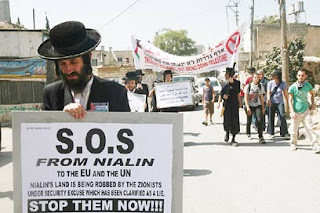 According to YNET's Neta Sela,Neturei Karta, "Anti-Zionist Orthodox faction denounces military operations in Strip as 'ferocious, bloodthirsty acts of ethnic cleansing', say they fail to understand why world powers 'allow Zionists to commit such crimes against Palestinians'" This is printed on the web in a box with the heading "Propaganda". Good to know that there is an independent press in Israel. Why would you have to be a cynic to say they just want to advance their anti-Zionist agenda? Their position on Zionism is well known, as is the Palestinians' position. On this issue they're natural allies. Cynical are those who want to prevent fraternising with those from the other side who are precisely not the enemy. In the "Propaganda" box, the "full story" links to http://dataentry.ynet.co.il/articles. Nothing there. So, short of further info, it's YNET propaganda indeed. I find it surprising that I find myself on the same side as Neturei Karta in opposing the IDF committing ethnic cleansing in Gaza. I agree that using the IDF to expel, by force, every single Jew living in the Gaza Strip, a place Jews were living CONTINUOUSLY for 2000 years, was a terrible crime. Associating with Neturei Karta just goes to show that one's basic motivation is to hurt Israel rather than to help Palestine. IMO that is nothing to be proud of.